Package for 1 Couple- 2 Adult & 1 child below 5 yrs. No. of Nights- This Package is for 2 nights only. Room Plan- 1 Double Room with 1 kid below 5 yrs. sharing parents bed. Swiss Tent- 1 Double Swiss Tents with 1 kid below 5 yrs. sharing parents bed. Meals Included- 1 Breakfast at Hotel +1 Dinner & 1 Breakfast at Desert Camp. Take Lunch in the City at Restaurant or at Hotel. Take Dinner at Hotel or in the City as per your choice. After Fixed Menu Breakfast Checkout From Hotel. Watch remaining city sight seens. 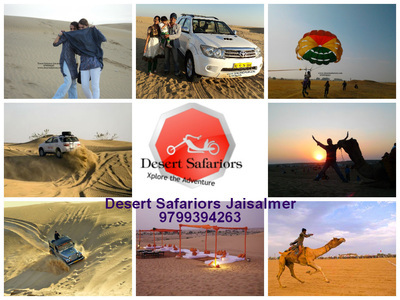 Take Lunch in the City and after Lunch move to Sam Desert for Desert Safari which is 45km from the city. At 3:00 Pm Checkin in Desert Camp. At 3:45 Pm Take 1 camel ride on twin sharing basis (2 pax on 1camel). At Sam Dunes click photos, enjoy, play and watch Blissful Sunset over Dunes. Traditional Welcome at Camp with Aarti-Tikka & Dhol. Night Stay in Desert Camp. The Above Package is not applicable during Christmas/ New Year or any other festival. 100% advance to be deposited to confirm the package. Checkin Time of Desert Camp is 3:00 pm & Checkout Time is 10: Am. 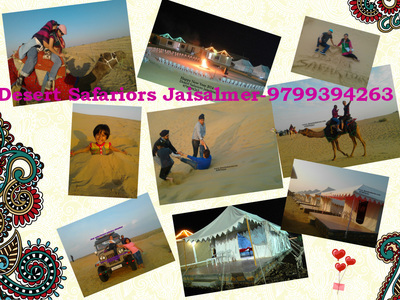 Note:On First Day if you are coming by train or car you can visit some places like-Patwa Haveli, Gadisar Lake and Shopping.On Second day you can visit Jaisalmer monuments & sight seens of Jaisalmer like Fort, Havelies, Amar Sagar lake, Kuldhara ,Bara Bagh & Tazia Tower, if you have your car. or else we can arrange it for you at very nominal price.